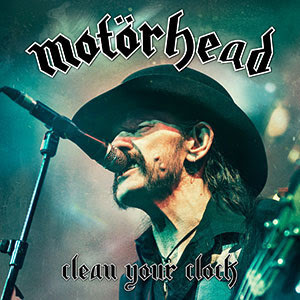 Motorhead will release a new live album, “Clean Your Clock”, on May 27. The band were recorded over two shows at the Zenith in Munich, Germany last November on what turned out to be their final tour as founder Lemmy Kilmister passed away at his Los Angeles home on December 28. Produced by Cameron Webb, the project landed Motorhead the highest US chart position in their career, debuting at No. 22 on the Billboard 200 with opening week sales of 11,000 copies upon its release last August. Family, friends and fellow rockers paid tribute to Kilmister at a January 9 memorial service in Hollywood that was streamed live to more than 250,000 viewers worldwide via the band’s YouTube channel. Among the many tributes was one by Food & Beverage Magazine, who officially renamed Jack & Coke as “The Lemmy” in honor of rock legend. Alice Cooper’s Hollywood Vampires paid tribute to the late Motorhead frontman with a performance at the 58th annual Grammy Awards last month in Los Angeles.